The aim of this journal issue is to showcase written-up versions of some of the work presented at the Fourth Meeting of the Nordic Network for Philosophy of Science. The conference took place on the 21st-23rd April 2016 in Pärnu, Estonia, and was organized by the members of the Chair of Philosophy of Science of the Department of Philosophy at the University of Tartu. The present issue contains five peer-reviewed contributions sourced from the 2016 meeting, and one independently submitted peer-reviewed paper that did not serve as the written text of a conference presentation. 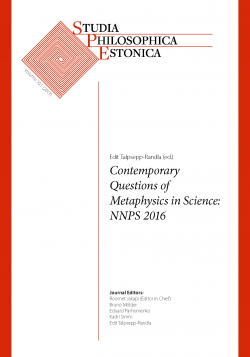 As the title of the issue (“Contemporary Questions of Metaphysics in Science”) suggests, all contributions are to a greater or lesser extent focussed upon metaphysical questions - pertaining either to science in general or to some specific branch of science.